Just as its name implies, the half double crochet eliminates one step from the double crochet stitch and works up about half as tall. 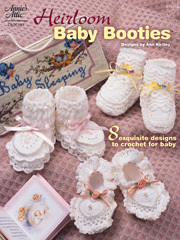 Remember, you will never work in the first chain from the crochet hook unless the crochet pattern you are working specifically directs you to do so. 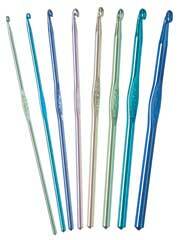 We will now begin working Row 1 of half double crochet. 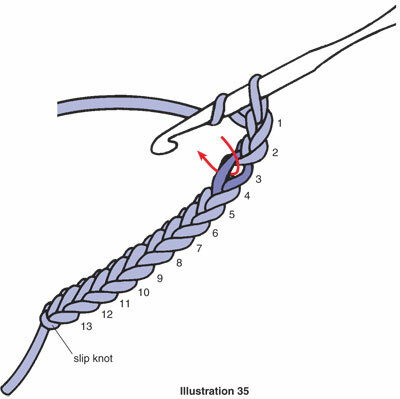 Step 1: First make a slip knot and chain 13. 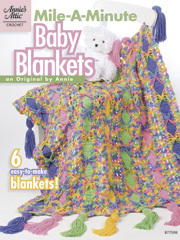 Bring the yarn once over the crochet hook from back to front, skip the first two chains and then insert the hook in the third chain from the hook (see illustration 35). Remember not to count the loop on the hook as a chain. Step 2: Bring the yarn over the crochet hook and draw it through the chain stitch and up onto the working area of the hook. You now have three loops on the hook (see illustration 36). Step 3: Bring the yarn over the crochet hook and draw it though all three loops on the hook in one motion (see illustration 37). 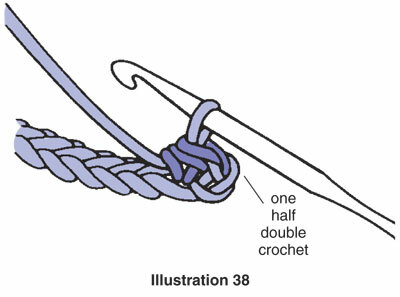 You have completed one half double crochet; one loop remains on the hook (see illustration 38). To finish the row, continue to work one half double crochet in each remaining chain across the row. Now that we have completed the row, you should stop and count your stitches. 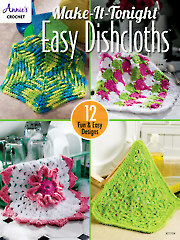 You should have 12 half double crochets, counting the first two chains you skipped at the beginning of the row as a half double crochet (see illustration 39). Turn your work counterclockwise. To work row 2, you need to bring the yarn or thread up to the correct height for the next row. To raise the yarn, chain two (this is called the turning chain). Like double crochet, the turning chain counts as a stitch in half double crochet unless your pattern specifies otherwise. 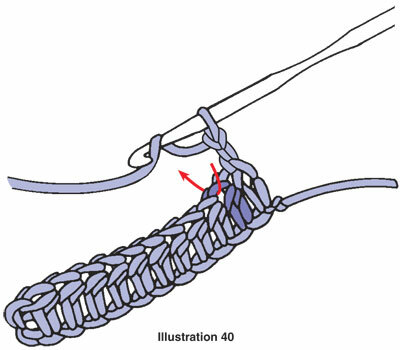 Chain 2, skip the first half double crochet of the previous row; be sure to insert the crochet hook under top two loops of the stitch, work a half double crochet in the second stitch (see illustration 40) and in each remaining stitch across the previous row. You can continue practicing or fasten off. 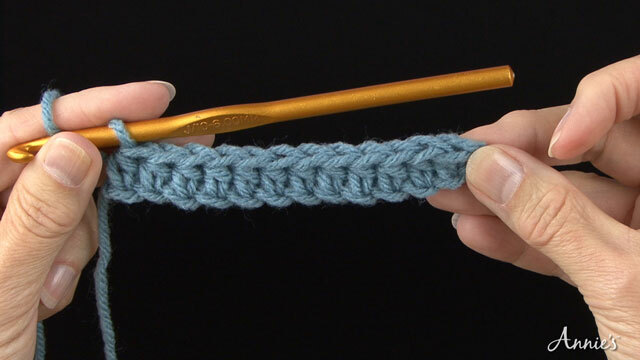 If you are continuing on, remember to chain 2 before your first half double crochet. After the last stitch, cut the yarn, leaving a 6-inch end. As you do when you take your crochet hook out for a break, draw the hook straight up, but this time draw the cut yarn end completely through the stitch. Pull the 6-inch end to close.